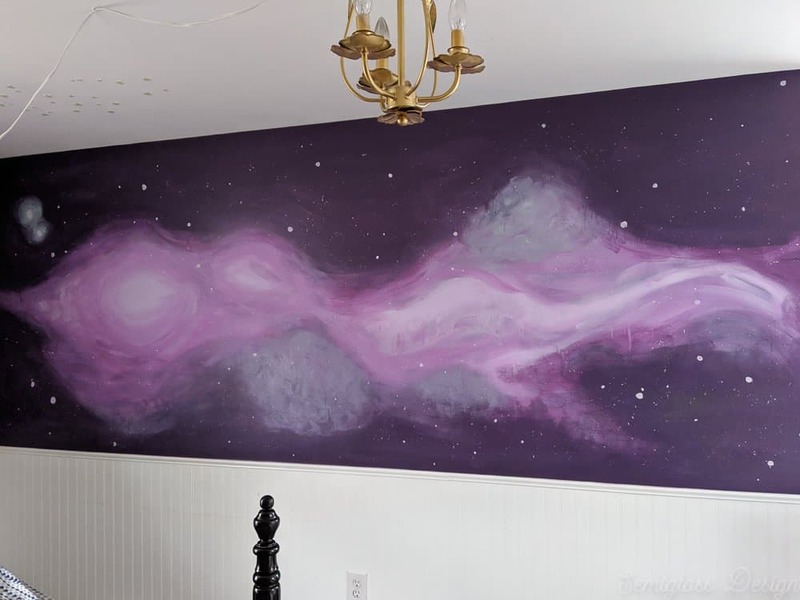 Learn how to paint a DIY galaxy wall mural. 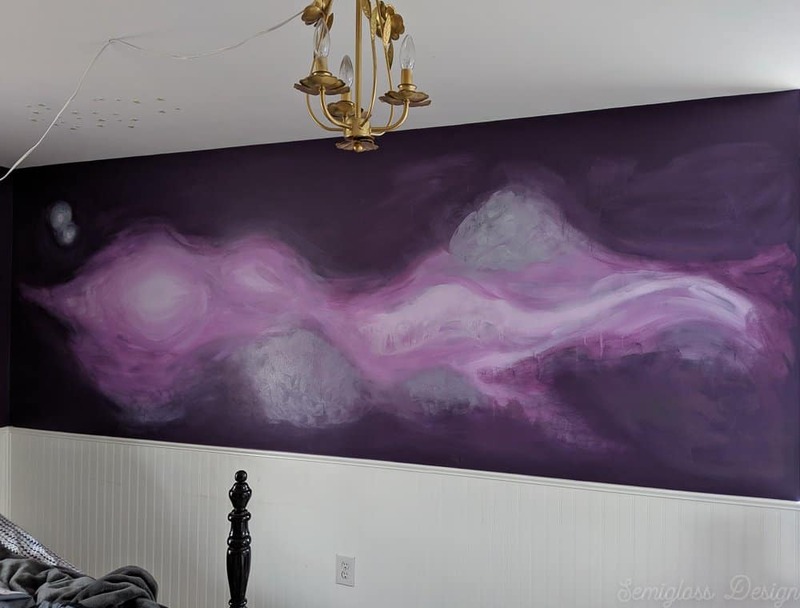 This hand-painted mural is a variation of my painted ombre dresser, but on a wall! 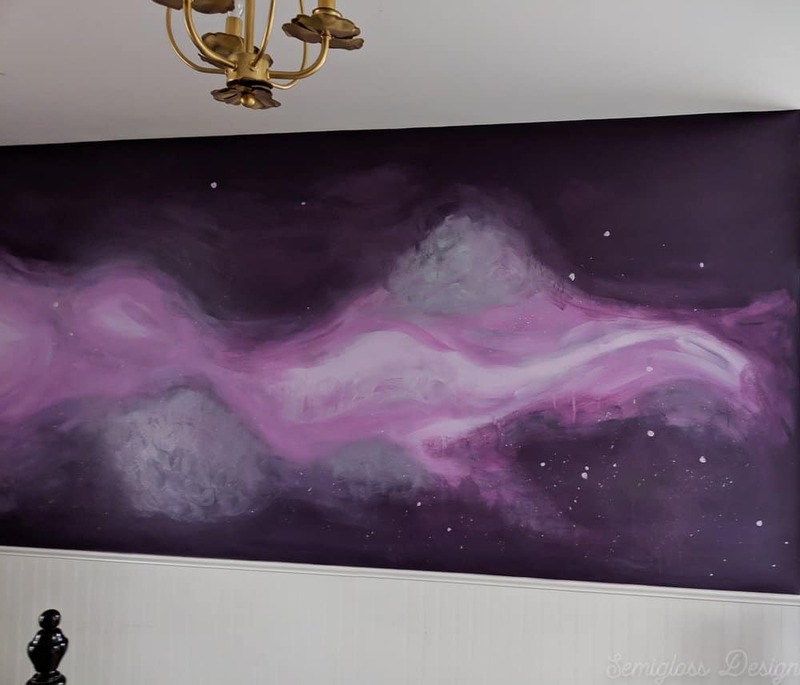 Last weekend, while my daughter was at a sleepover, I started her room makeover with the DIY galaxy wall mural. 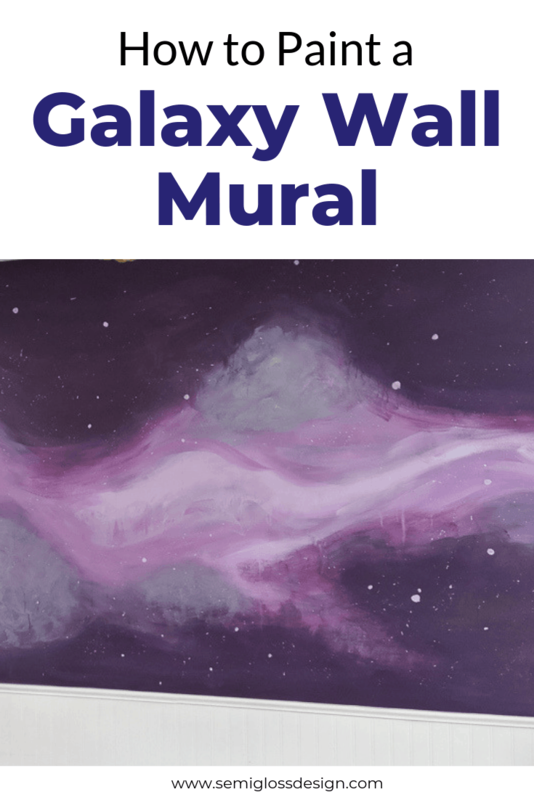 We had discussed it beforehand and I knew that she preferred the mostly purple galaxy images versus the more colorful ones. 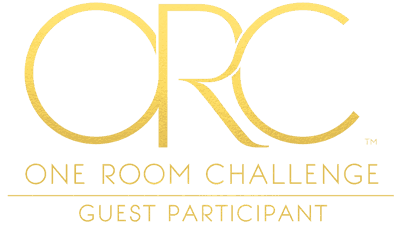 It’s Week 2 of the One Room Challenge, a challenge where 20 featured designers and over 200 guest participants makeover a room in just 6 weeks. I love seeing everyone else’s plans and progress. 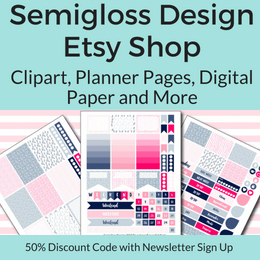 Last week, I shared my plans for my daughter’s boho room makeover. I used the glaze, but it worked the same as spraying the paint with water. 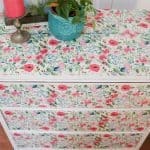 *Chalk paint isn’t necessary. I had it on hand, so I used it to add the blue. Prepare your walls as necessary. 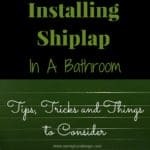 I had to remove vinyl decals, clean the walls and fill nail holes. Be sure to prime your nail holes after they’re sanded and dry. 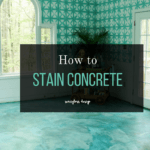 Protect your floor with drop cloths. This has the potential to be messy. 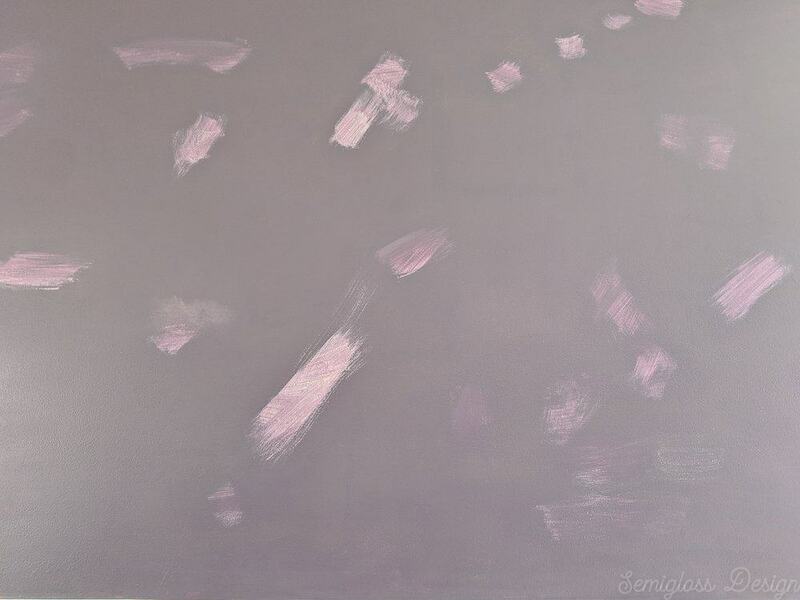 Paint your walls the darker background color. 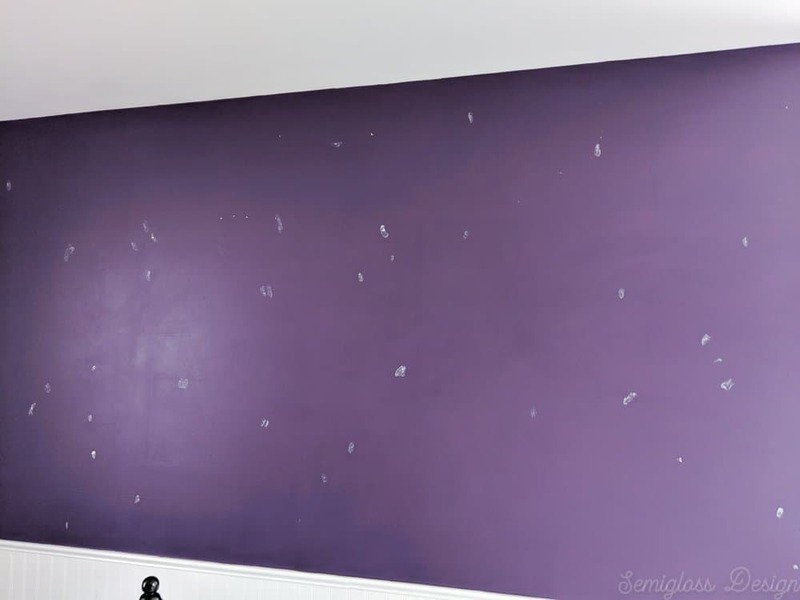 Her walls were already this color, so I just did touch up over the primed nail holes. The areas around the edges received 2 coats of paint. 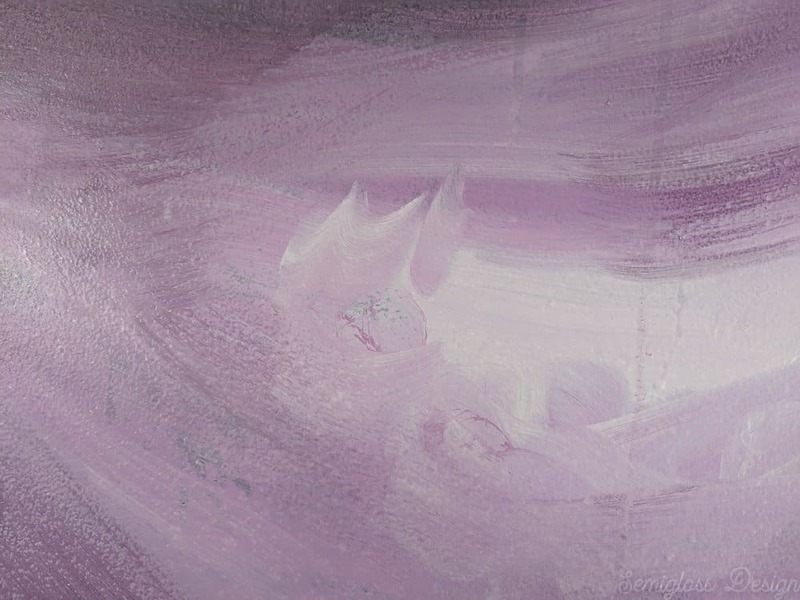 Paint a blobby shape using the lightest color first. 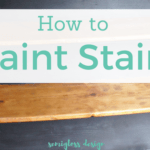 Spray it water as you go and blend it to soften the paint. Add the medium color around the edges and blend as you go. Spray water and watch for drips. Some drips are okay, but too many look weird. Blend and blend some more. Add the dark color and blend it with the edges of the other colors and paint over the dark color with your brush. 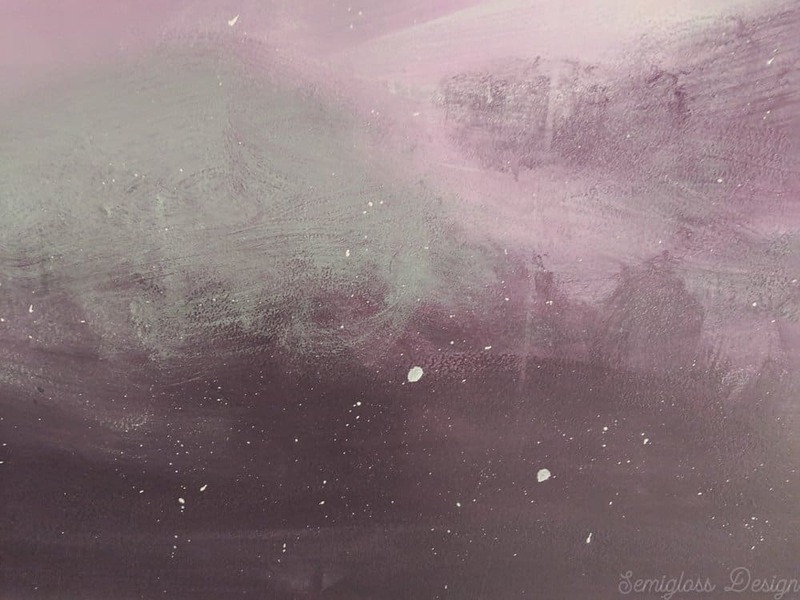 This creates a hazy look in the dark areas instead of a solid color. The light blue was used to create the cloudy looking parts. The addition of blue helped the purples from feeling too flat. 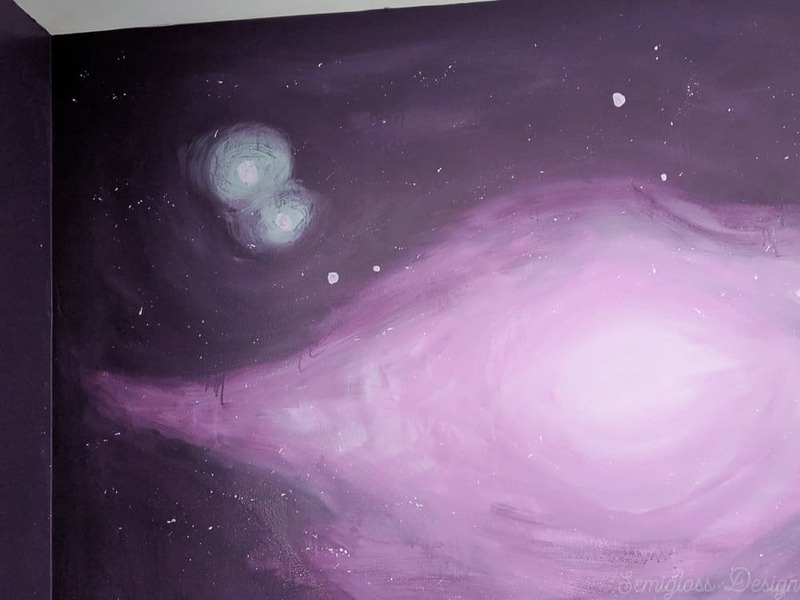 Use light blue to paint a few halos for the stars and blend them with the background. 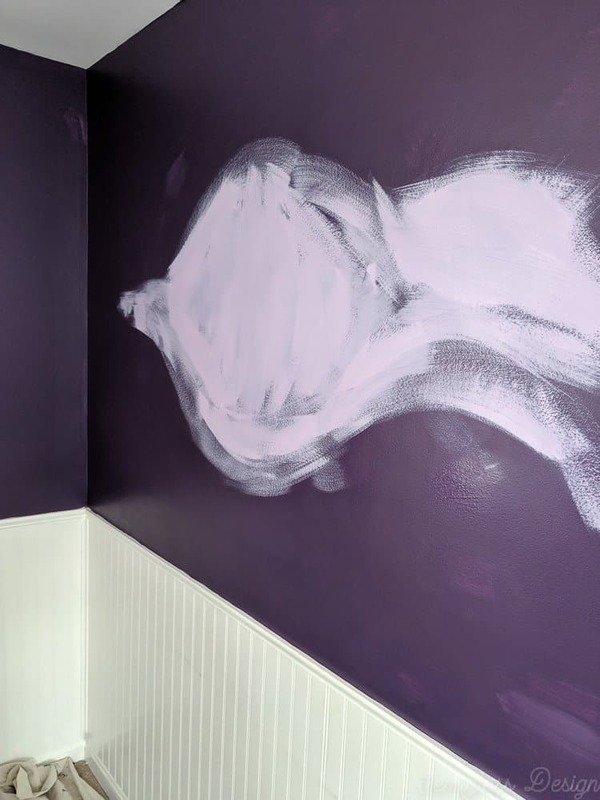 Paint dots in varying sizes on the wall using the lightest color of purple. 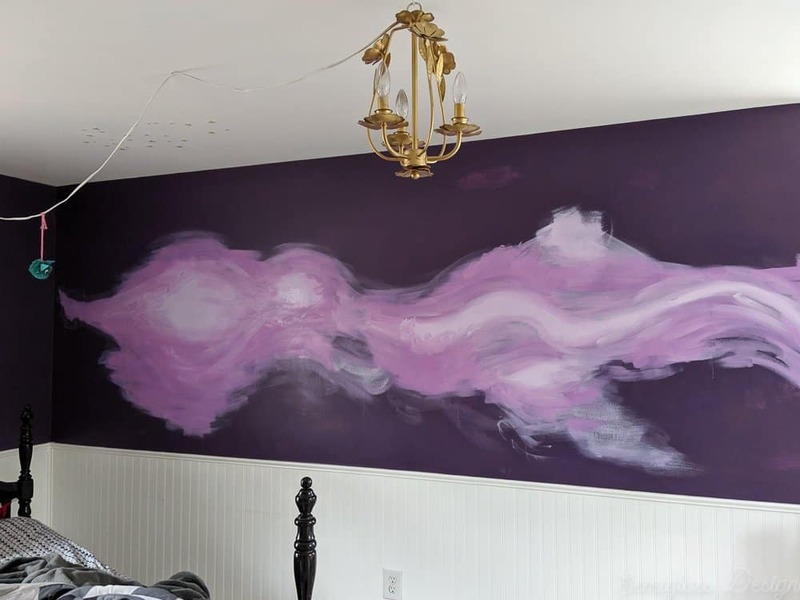 Use an art brush to flick paint paint on the walls. 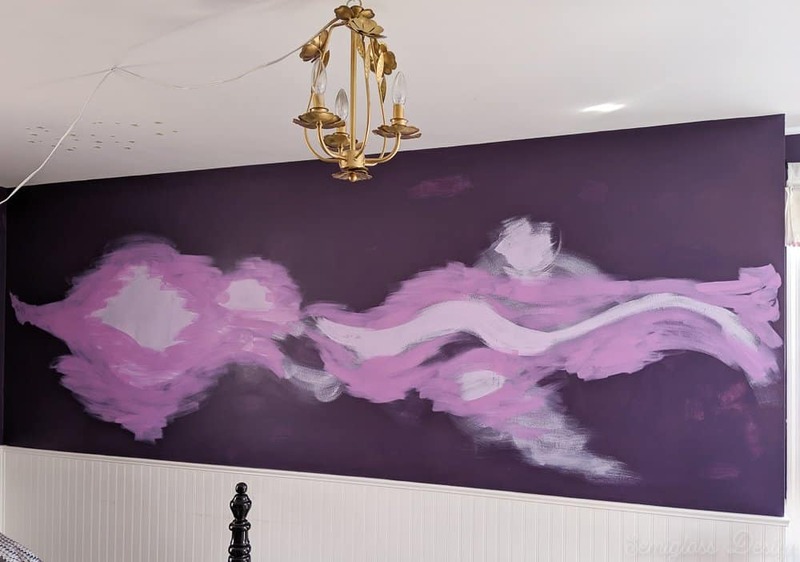 Just rub your thumb across a wet brush flick the paint onto the walls. Stiff flat edge brushes worked the best. If you get splatters that are too big, make them into larger stars. It’s going to look bad at first. Keep going and blending. Step back every now and then to make sure it looks good from far away. It always looks better from far away. 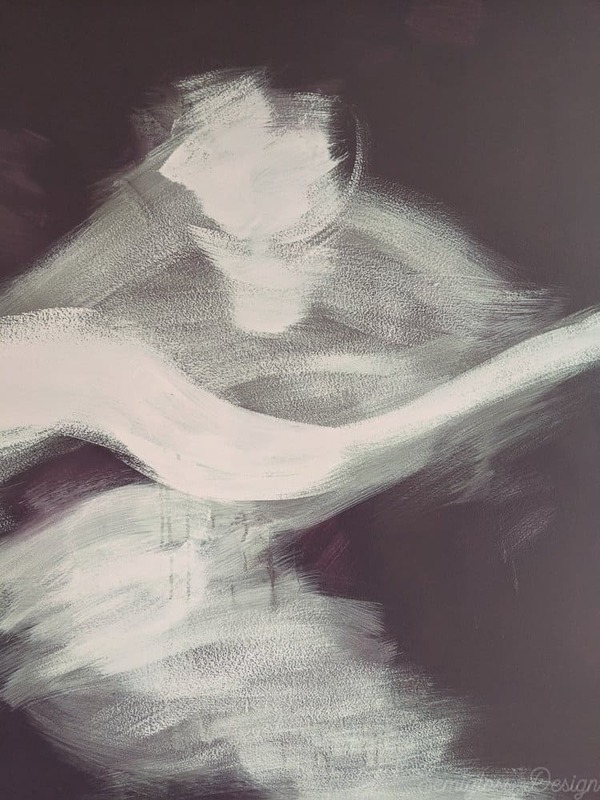 Keep blending the paint until you’re happy. Avoid hard edges and defined shapes. I can’t wait to see the whole room come together! What a BEAUTIFUL mural! I am so very impressed with your mad painting skills! Wow, that is incredible! I can’t believe you freehanded that. You are so talented. I like the flick the brush technique for creating the stars. WOW! This is just beautiful! Great tutorial too…you make it look so easy! Way to go Emy!!! Amazing mural. Love that purple! emy, this turned out SOOOO well! love love love! Wow Emy, you are so talented! This looks great. Looove how the mural came out! Emy this is so cool your creativity is always so inspiring! 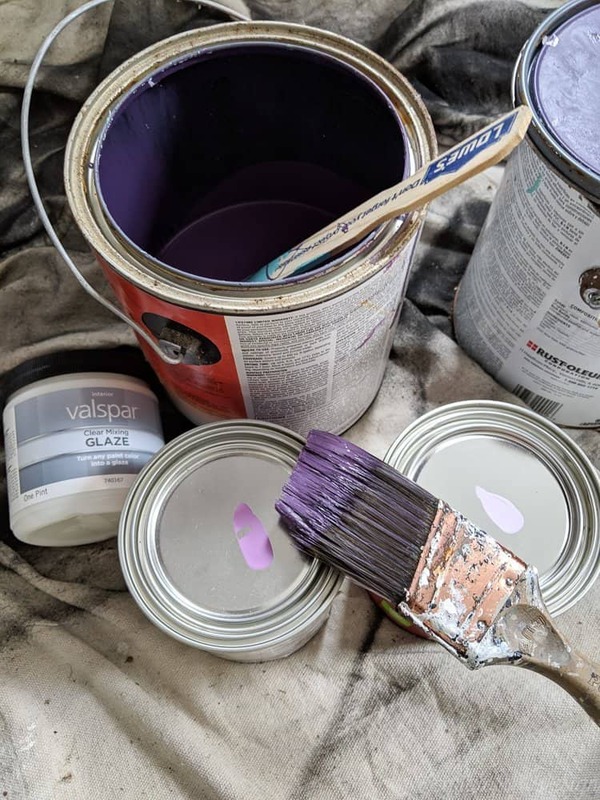 Love that deep purple color that you chose too, I had a bedroom that color when we first got married about 22 years ago and this color made me miss it the serenity of it. Can not wait to see more of this room!! !